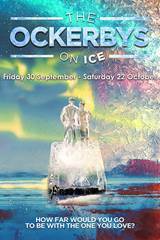 We have been to see quite a few shows over the last few weeks, The Ockerbys on Ice is showing at The Dukes, Lancaster until Saturday 22nd October and is definitely worth seeing. The Ockerbys on Ice has been written by Coronation Street writer, Debbie Oates and premiered at The Dukes, Lancaster. We were lucky enough to be invited to see the first performance which was very exciting. There was no red carpet but we did dress for the occasion! Performed in The Round theatre, an intimate area with seating all around the stage, you can really get into the story and we felt like we were up in Scotland with the family. The Dukes have a tradition of presenting new work and after a few false starts the play finally made it to the stage, thanks in part to a crowdfunding campaign and donations. It might have taken a few years to reach the stage but it has certainly been worth the wait. The play is set in the near future when medical science is racing towards a time when freezing, or vitrifying, a body is possible. Terminally ill Dennis Ockerby, played by David Crellin, and his wife Viv, played by Karen Henthorn, win the chance to have their heads ”frozen” when they die in the expectation that a new, disease free body will be available in the future. They are to be the first to undergo the procedure but will their love last as long as their brains do? A real comedy, the story explores the wide range of feelings that the couple go through in Dennis’s final hours and also their relationship with their son Michael, played by Jack Hartley. The writer portrays a middle aged northern couple, married for 30 years, with great humour and accuracy - I could easily imagine people I know behaving just like the Ockerbys. For us the star of the show was Karen Henthorn, perfectly cast as Viv Ockerby. I could really empasise with her as she struggled to cope with Dennis’s impending death and the implications of his planned preservation. With most of the story taking place in a medical room a simple set was bolstered with the use of clever live action video feeds with hospital equipment and background music setting the clinical theme. The audience were involved in the performance, playing the role of the public watching the live internet streaming and also listening to the lecture on medical history given by Dr. Taylor Devine played by Lynsey Beachamp. We really enjoyed our evening, the play was certainly thought provoking but can be enjoyed as a family drama too. The play is showing at the Dukes until 22nd October with the theatre suggesting that the play is suitable for ages 12+. The Dukes is a lovely theatre and you are always made to feel very welcome by the helpful and friendly staff. There is a lovely bar area in the entrance and being in the centre of Lancaster there is plenty of choice for a pre show drink or meal. There is a car park just across the road and plenty of other car parks just a short walk away.